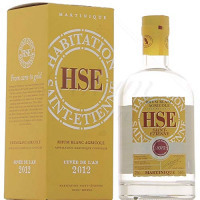 The HSE Blanc 2012 vintage is a selection of the most characteristic distillates from 2012 and is only 1% of the Martinique distillery's annual production. Two long years of ripening, mixing and slow reduction give this vintage, elegance and aromatic finesse despite it packing a huge punch at 50% abv. The nose opens with aromas of orange blossom sweet almond and exotic fruits subtly enhanced with notes of white pepper. The mouth offers notes of white flowers, clementine and fine spices that structure the profile while on the finish there are beautiful buttery notes.